I am inspired by professional rock climbers … regularly! That “Career Path” would have been fantastic, had I only pursued it earlier. But I have different motives now, and conflicting priorities and responsibilities to the “traditional” professional athlete lifestyle. But again, I am inspired by their ability and dedication. I have many favorites … but naturally among them is THE Chris Sharma. I ran across an article online for Outside Magazine, interviewing Chris on his Training Secrets. It is classic Chris Sharma; just get out and climb as much as possible. One answer did grab my attention. It intrigues me that he mentions these three supplements specifically. 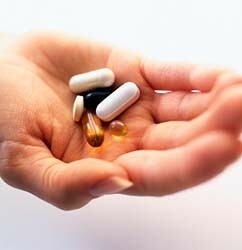 I have long been an advocate for proper supplementation, which is more a matter of mindset than which pills to take. My background (and degree) is in Physical Education, Kinesiology, Exercise Physiology, & Coaching. I am by no means a nutritionist or dietitian, but I do follow these topics closely. I’d like to take these three supplements and expand individually on why they are beneficial for climbers and non-climbers alike. And why supplementation is often necessary. First up is one of my all time favorites: Glucosamine. WHAT? Glucosamine chemically is actually a specialized sugar called an amino sugar, and is comprised of C6H13NO5, for all the science geeks out there. It is often found in the form of Glucosamine Sulfate and Glucosamine Hydrochloride. Additionally it is often combined with a partner supplement known as Chondroitin. WHY? Please note that I am not making medical claims. Studies have varied in results and you should make your own educated evaluation. As well, I personally experience a benefit from supplementing with Glucosamine, but different people’s bodies likely respond at varying levels. Glucosamine has been shown to help protect, lubricate, and cushion cartilage. There have also been indications that it helps your own body in the strengthening of ligaments and tendons as well. I do notice a difference in my fluidity of motion and also a reduction in pain. This is most noticeable in my spine and more specifically, I notice when I’ve forgotten to take it for a few days. Also, although there is not scientific research behind this, I have been climbing for 12 years now and have not had a single bout with tendonitis or major finger tendon injury. And only one or two minor tweaks in my A2 pulley of my ring finger which were pain free in less than a week. This lack of injury may or may not be a result of my years of Glucosamine supplementing. WHO? First off, and probably the most obvious climbers that would benefit from supplementing with Glucosamine, are the boulderers. The repetitive jarring of the hip, knee, and ankle joints can be very wearing on the joints. I would personally recommend it to anyone 30 years or older, or even earlier as I began supplementing around 24 years old. Most manufacturers suggest that children under 12 years of age, pregnant or nursing women, or those with medical conditions like diabetes and hypoglycemia, should consult a physician before use. Also, those with seafood allergies should check with a physician as it is most often derived from the shells of crustaceans. WHEN? Most varieties I have seen recommend taking Glucosamine twice daily with meals. Although, as Chris Sharma talks about so often, learn to listen to your body. WHERE? There are so many brand names and likely just as many retailers that supply supplements. I do have my personal recommendation on a particular brand based on their quality and industry efficacy standards plus their unmatched Satisfaction Guarantee. I will not force that brand on you but would love the opportunity to share two things with you, provided you are interested in supplementing. First is the brand, reputation, and standards. And second is an opportunity to have your personal supplementation support the climbing community directly. Click on the following link or the Nutrition Partnership link on the top left for details. Next month I will continue digging into Chris Sharma’s quote by discussing “plant-based vitamins”. Posted on August 2, 2013, in Injury Prevention, Nutrition and tagged Chris Sharma, climber, climbing, Glucosamine, Outside Magazine, rock, supplement. Bookmark the permalink. Leave a comment.